Read Professor Real Estate®’s 5 Meaningful Ways to Cheer Friends in Real Estate! Suzanne Hollander cheers Marti Mang, Total Bank Commercial Lender on her Lifetime Achievement Award, Women in Int’l Trade on Key Biscayne! Each of the 5 will help you build real lasting friends who love to share their success with you and be a part of your success! P.S. Marti & I do these 5 all the time! Professor Real Estate®’s 5 Meaningful Ways to Cheer Friends in Real Estate! Refer Biz! If you see your friend working hard, doing-a-great-job – refer her business. If she’s a broker, refer sellers or buyers. If she’s a banker, send her someone looking for a loan. If he’s a lawyer, send him someone who needs advice…etc! Say It on LinkedIn! Write a recommendation on LinkedIn, Talk about your friend’s skills, how he or she helped you or a client. Click here for Suzanne Hollander’s LinkedIn and Click here for Marti Mang’s LinkedIn! Help a Friend Win! Nominate your friend for an award or scholarship – he’ll never forget that you believed in him enough to submit his name. There are lots of awards out there and I’m still close with everyone who nominated me for awards & scholarships! Muchas Gracias !! Help Your Friend Get a Board Seat! Nominate your Friend for a National Board of Directors or Government Board that needs real estate expertise. A BIG THANK U to everyone who nominated me for the Miami Beach Affordable Housing Real Estate Advisory Board, where I am Vice Chair. Invite a Friend to Speak or Work on a Deal Together! I recognize friends by inviting them to speak in classes and public events I lead! Its fun to share the experience of teaching with a friend and to shine the spotlight on his success! As a Broker, its always good to work on real estate deals w good friends in the business! 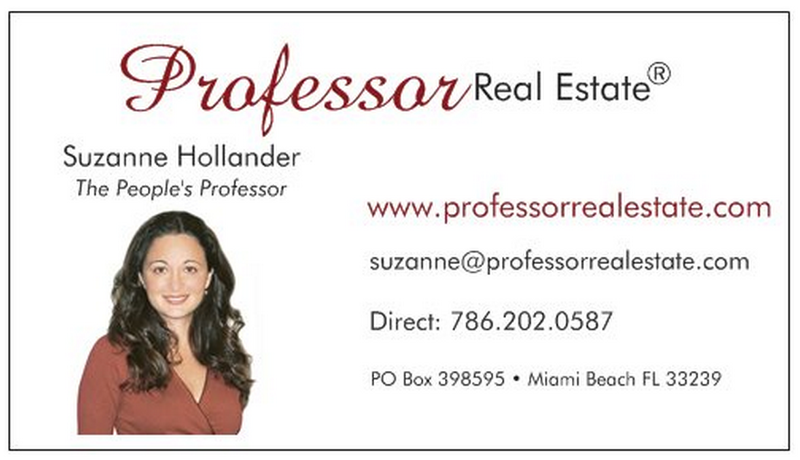 Contact Professor Real Estate® Suzanne Hollander for real estate coaching and empowerment. She motivated and empowered 1,000s of clients, students and followers and she can help you meet your real estate goals! « Say 3 Cheers to Sunny Florida Real Estate!